Immunogen: Synthetic peptide corresponding to aa 250-325 of human Hsp90. Immunohistochemistry analysis of human prostate tissue stained with HSP90, pAb at 10µg/ml. 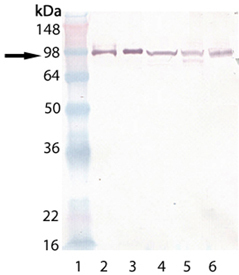 Western blot analysis of HSP90, pAb (Prod. No. ADI-SPA-836): Lane 1: MW marker, Lane 2:HSP90α (human), (rec) (Prod. No. ADI-SPP-776), Lane 3: HSP90β (human), (rec) (Prod. No. ADI-SPP-777), Lane 4: HeLa (heat shocked) (Prod. No. ADI-LYC-HL101), Lane 5: 3T3 (heat shocked) (Prod. No. ADI-LYC-3T101),Lane 6: PC-12 (heat shocked) (Prod. No. ADI-LYC-PC101).